Het is even uitpluizen hoe het allemaal werkt, maar eind goed al goed. Vandaag mijn eerste berichtje " 101 DINGEN WAARVAN MIJN HART GAAT ZINGEN " met een foto van SNEEUWKLOKJES die ik bewerkte in een Five Storyboard Sjabloon HIER van The Coffeeshop Blog. It takes some figuring out how it all works but all's well that ends well. 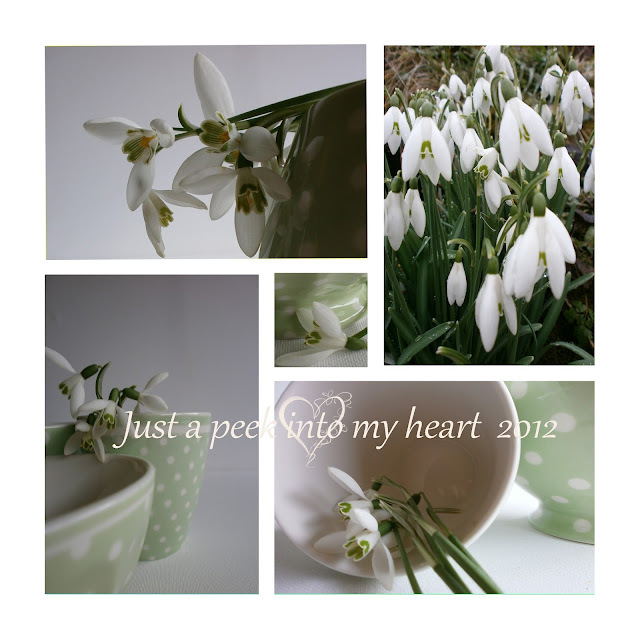 Today my first entry " 101 THINGS THAT MAKES MY HEART SING " with a picture of SNOWDROPS which I edited in a Five Storyboard Template HERE of The Coffeeshop Blog. "101 THINGS THAT MAKES MY HEART SING"
Coffee first thing in the morning - My Kids - Heartwarming Quotes - Rubber Stamps - Kim Klassen Textures - Shopping - Summer Season - Janome Sew Mini - Shoes (size 1 = EU 34) - Handmade Cards - Short Poems - Calligraphy - Heidi Swapp’s Book “Love your handwriting” - English Cottage Gardens - Afternoon Tea - Dark Chocolate - Beautiful Phrases & Words - Wonton Noodle Soup - Hot Baths with Lavender Essence - Frank Sinatra - Vintage Fabric - Singing out loud in my car - Spring Season - Crochet - French Cheese - Theatre - Olives with garlic - Interior decoration - Photography - Winter Season - Christmas - Buttons - Ribbons - Tappas - Fall Season - Enya - Trees - Dabbling - Art journaling/Mixed media - Living in Maastricht (Netherlands) - Facades of old Houses - Movie The Bucket List - Beads - Pineapple - High Tea - Crockery - Flea markets - "Chickensoup for the Soul" Books - Pink Champagne - Digital Kits - Michael Buble - Gourmet Meals - Photoshop Elements - Lace - Presents - Muscari Armeniacum - Autumn Leaves - Vases - Hot Chocolate with whipped cream - Trade Fairs - Piano - Knitting - Starry Nights - Mango - Sightseeing Trips - A Bouquet Old English Roses in various colors - Norah Jones - Candlelight - My Rörstrand Ost India Crockery - Wine - Pottery - Perfume - Tulips - French Baguette - Wicker Baskets - Blue Skies - Handwritten Letters - Happinez Magazine - Pearls - Hearts - Lingerie - Embroidered Fabric - Strawberries - ME-Time - Concerts - SNOWDROPS - Surfing on the internet - Gardening - Sunglasses - Vacation in France - Handbags - Castles - Handmade Paper - Botanical Candles - Pine Cones - Blossom - Angels - Poor man’s Silver decorations - Beach Houses - Romantic & Dreamy - Interior Colors White - Sand - Grey - Blue - Green.